In 1800, Europeans governed about one-third of the world's land surface; by the start of World War I in 1914, Europeans had imposed some form of political or economic ascendancy on over 80 percent of the globe. The basic structure of global and European politics in the twentieth century was fashioned in the previous century out of the clash of competing imperial interests and the effects, both beneficial and harmful, of the imperial powers on the societies they dominated. 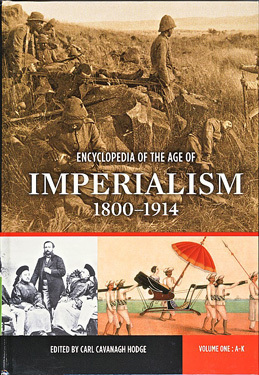 This encyclopedia offers current, detailed information on the major world powers of the nineteenth century and their global empires, as well as on the people, events, and ideas, both European and non-European, that shaped the Age of Imperialism. Besides over 800 clearly written and highly informative entries, the encyclopedia includes primary documents, a chronology, and extensive introductory essay, a bibliography, a guide to related topics, and a series of useful maps. The story of a fascinating but often overlooked period of Napoleon's career. The time between Waterloo and Napoleon's surrender to the British is filled with intrigue and possibilities, and this book covers all of the exciting details, often in the words of those who were there! Six alternative history stories answered by six noted historians. Introduction and introductory material, as well as a response to one alternative history, by J. David Markham, editor. This is the Dutch version of Napoleon for Dummies. A vivid view of Napoleon’s last years and a major contribution to Napoleonic scholarship. Winner of the 2005 International Napoleonic Society’s President’s Choice award for Napoleonic Literature. Easy to read, well researched and documented, it is the one book on Napoleon for student and scholar alike! Imperial Glory is the first complete English translation of Napoleon’s Bulletins and also contains numerous reports by Napoleon’s marshals and others, most of which have never been published in English. Presidents Choice Award and the 2007 Count Las Cases Memorial Prize for Napoleonic Literature in English from the Instituto Napoleónico México-Francia. Winner of the 2003 International Napoleonic Society President's Choice Award for Napoleonic Literature. Betsy Balcombe's memoirs tell the story of her relationship with Napoleon on St Helena, the island to which he was exiled after defeat at Waterloo. I wrote the introduction to this edition. Selected as book of the month by Foundation Napoléon, Paris. Eight Napoleonic experts review Napoleon's life and legacy. An abridged audio book that includes all introductory material and some of the best stories found in the paperback version. I had the honor to be one of the readers. History Channel production that tells the stories of the greatest military commanders of all time, including segments with J. David Markham on Napoleon and Julius Caesar. A group of British and one American (J. David Markham) tell the amazing story of Napoleon's career. Ben Weider, J. David Markham and others set the stage for one of history's greatest mysteries: How did Napoleon die? A two-volume work on the world powers of the 19th and early 20th century. I contributed 10 articles. A wealth of information on this exciting epoch. I contributed 27 articles. A well-regarded basic reference work to which I contributed articles on Napoleon, Julius Caesar and Augustus Caesar. The Encyclopedia of Leadership brings together for the first time everything that is known and truly matters about leadership as part of the human experience. Includes my article on Napoleon Bonaparte. My friend Sean Richarz is composing a musical,Les Cent Jours De Napoleon (the 100 Days of Napoleon). I am honored to serve as historical consultant. follow his progress here. The world premier is scheduled for 15 July 2010. Military History Press publishes important books with lavish bindings. My friend David Fayon, the best source for period documents. La Revue Napoléon and an excellent catalogue of goodies. Gareth Glover's collection of primary source information. Lucid Cafe, a good basic reference resource on Napoleon and other historical figures.